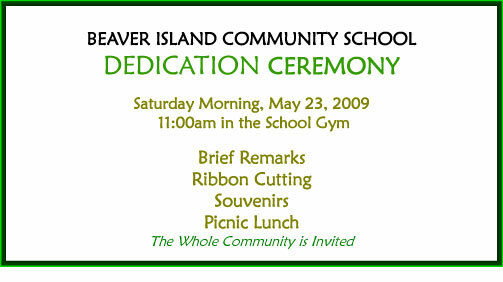 A thank you is never enough when someone goes above and beyond to help move the Island forward into the 21st Century. This plaque was placed on the door of the district library for her financial help in automating our local district library. 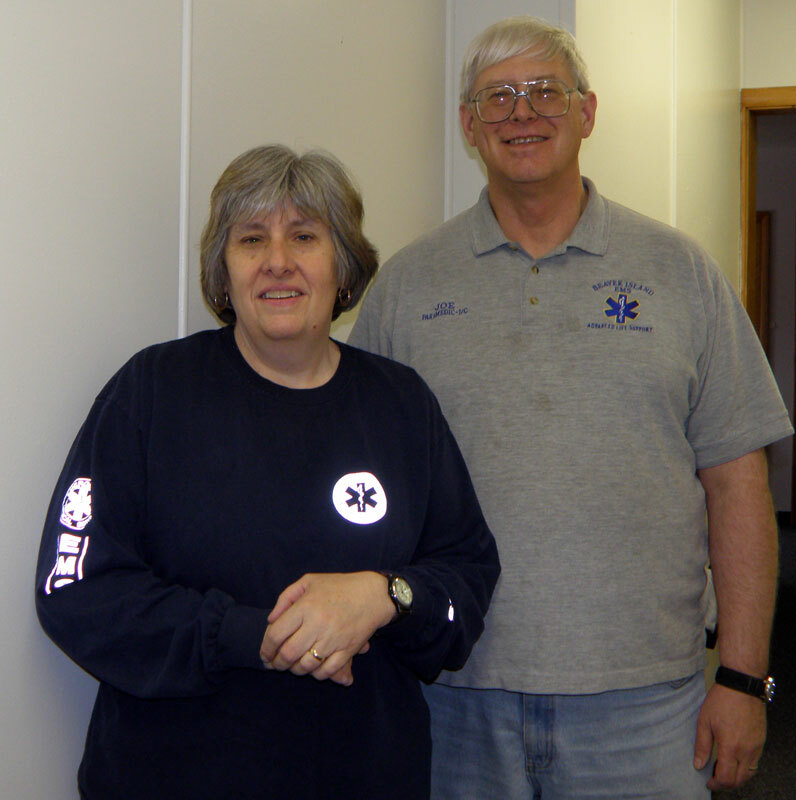 Three community volunteers started the Basic EMT course offered on Beaver Island beginning last September. For personal reasons, two of the three needed to withdraw from the class leaving only one person in the class. Executive Director of Beaver Island EMS Sarah McCafferty made the decision to continue the class even if there was only one interested person to complete it. 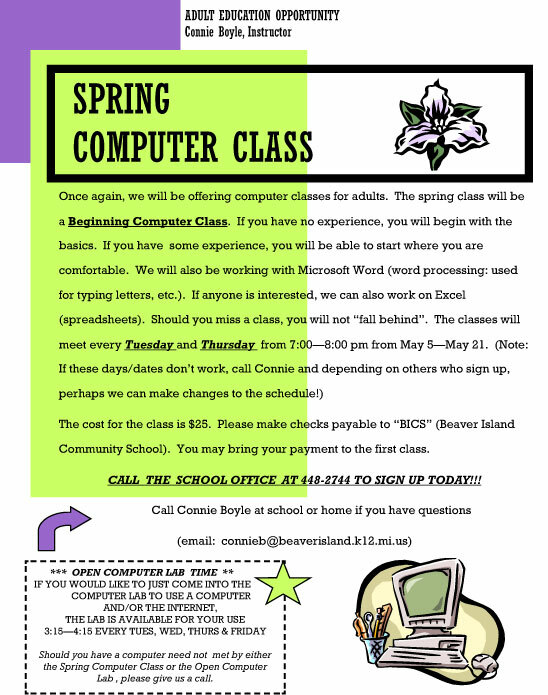 There were opportunities throughout the class for other island volunteers to get some State of Michigan required continuing education credits as well. According to Bob Struck, director of UPEMS, the regional coordinating agency for this region of the state, this is the smallest graduating class for Basic EMT in Michigan this year. The course officially ends on May 7, 2009, with the graduate having completed 192 hours of classroom instruction including lecture and practical skill practice with an additional 32 hours of mainland clinical practice with 16 hours of ambulance clinical and 16 hours or emergency room clinical time. The practical skills examination was completed on Tuesday, April 21, 2009, with BIEMS volunteers playing the part of patients and helpers. Sarah McCafferty, BIEMS Director, paramedic and instructor, tested the graduate on each and every practical skill required in the program as required by the National Registry of EMTs and the Michigan Department of Community Health, EMS Division. Attesting to her EMT skills were her instructor, Joe Moore, Sarah McCafferty, BIEMS Sponsor Agent, and Dr. Mitchell Carey, Charlevoix County Medical Control Authority Physician Director. The graduate will have to register online for the computer adaptive testing by the National Registry, then, possibly in June, go off the island to take her EMT Written Exam, so she can be licensed by the State of Michigan as a Basic EMT. Congratulations to Debra Plastrik for successfully completing the BIEMS Basic EMT Program! ISLAND TREASURES IS NOW IN NEED OF DONATIONS OF SPRING AND SUMMER CLOTHING, SMALL APPLIANCES, HOUSEHOLD ITEMS, AND CHILDREN'S BOOKS, COOKBOOKS AND TOYS. YOU CAN DROP OFF YOUR DONATIONS ON THURSDAY, FRIDAY, OR SATURDAY BETWEEN NOON AND 4:00 P.M. THANK YOU, ISLAND TREASURE'S STAFF AND B.I.F.D.A. 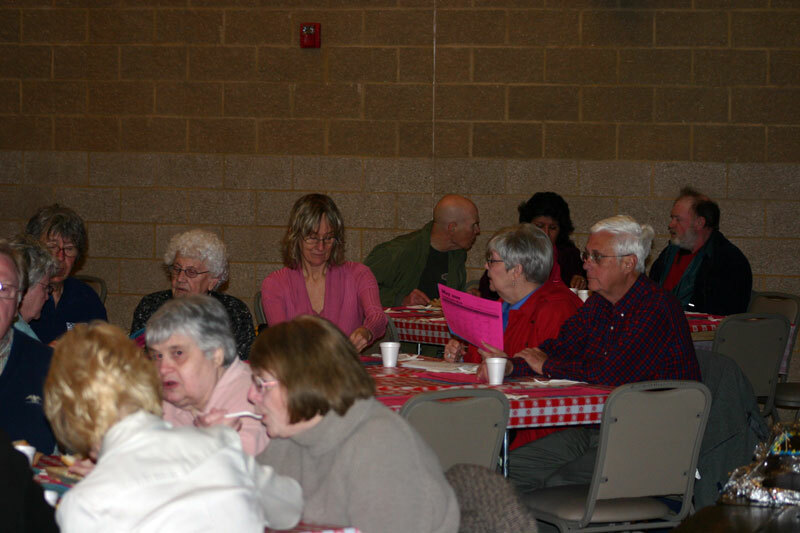 This Sunday, April 19, 2009, the senior dinner was held at the Beaver Island Community Center. 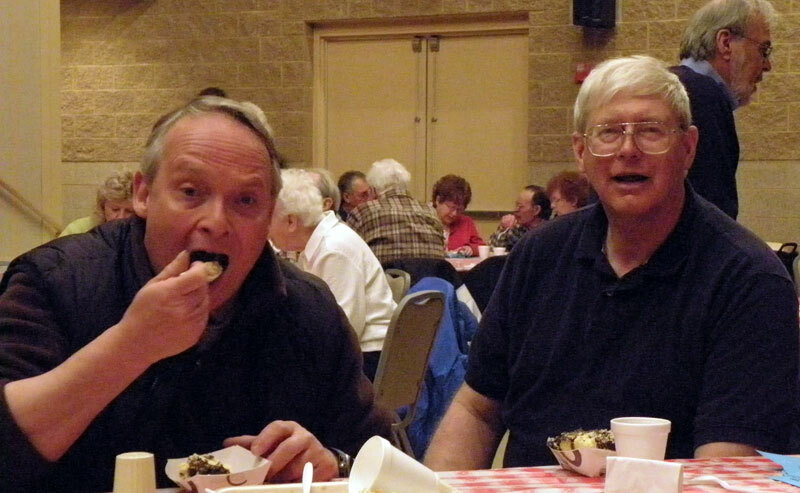 It was well attended with one hundred and four participants this month. This was probably due to the wonderful gathering to help celebrate and thank the outgoing Charlevoix County Sheriff's Department Deputy Jake Wasylewski and his wife Kara, and to welcome the new CCSD Deputy Travis Williams and his family. Jim Birdsall states, "It was all Ken Taylor's idea." Jack states, "We're gonna miss you." We are all familiar with the late "around the horn" suggestions after a busy night at one of the pubs on the Island, but it is springtime and, for those not able to get out and see it, this first trip around the Island is for you. A gorgeous day with a gorgeous Island could not be beat. The Northwest Michigan Community Action Agency (NMCAA) has a program for weatherization of homes. It is our understanding that as part of the stimulus program monies will be available for contractors to insulate and weatherize individual's homes. This could not only help people on the island but also if we can get our contractors on the island qualified it would provide some much needed jobs for our people. There is no charge for this work; however there is an income test for those participating. The forms indicate those limits. According to the NMCAA the monies have not been allocated and it will be some time before the program is started, however we would like to get as many people to send in the forms as it's on a first come first served basis . The forms are available at the library. Thanks for attending the meeting this week, the individual from the Wildlife Services was very pleased with how it went. 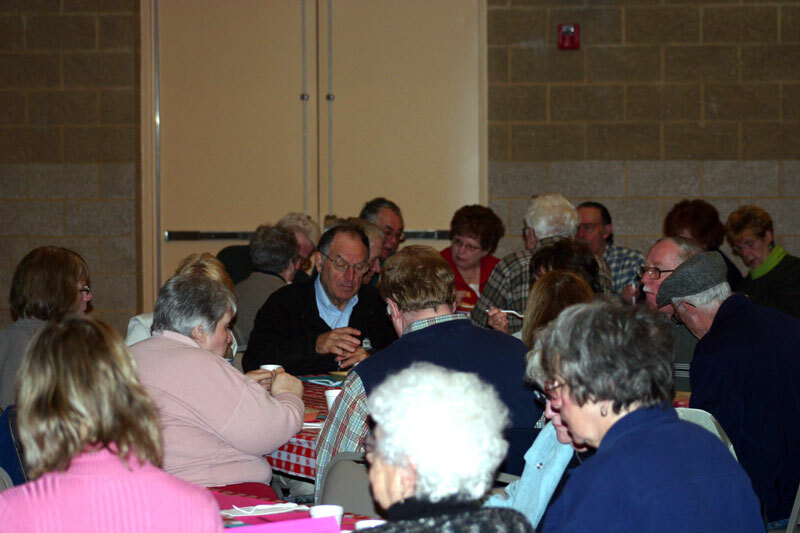 The next meeting is next Tuesday the 21 st at Peaine Township Hall at 7:00. If you missed the last meeting please feel free to attend this one as we need volunteers. This is to organize the efforts in the harbor only. The folks at Lake Genezarth are having a separate meeting, contact Gary Morgan for more information. You do not have to be a member to participate in this program. The first hardy soul was found outside the Beaver Island District Library using the WIFI hotspot, surfing the Internet, and doing business on the table out in front of the library. This is another sign that the season has begun. The Beaver Island District Library was the first Internet hotspot on Beaver Island to offer free Internet access purposely. The concept was one that has been replicated in several other businesses on the Island. Free Internet access is available at Island Airways, Fresh Air Aviation, the Shamrock and Harbor Market, the B.I. 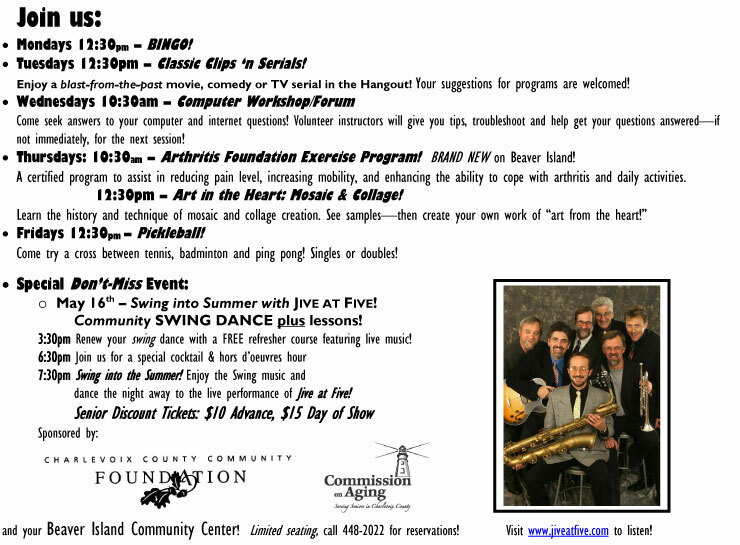 Community Center, and Beaver Island Realty to mention just a few. 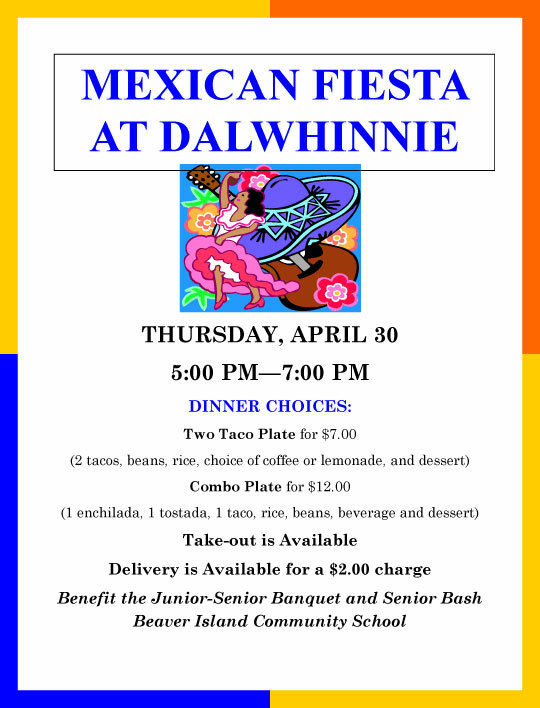 Dahlwhinnie's is the location to support the Junior-Senior Banquet and Senior Bash. Beaver Island Community School High School students recently returned from a three day trip to Chicago thanks to community support. Hartzlers' Charters and Tours, Inc., of Lake Odessa donated bus travel and lodging for the students and chaperones. 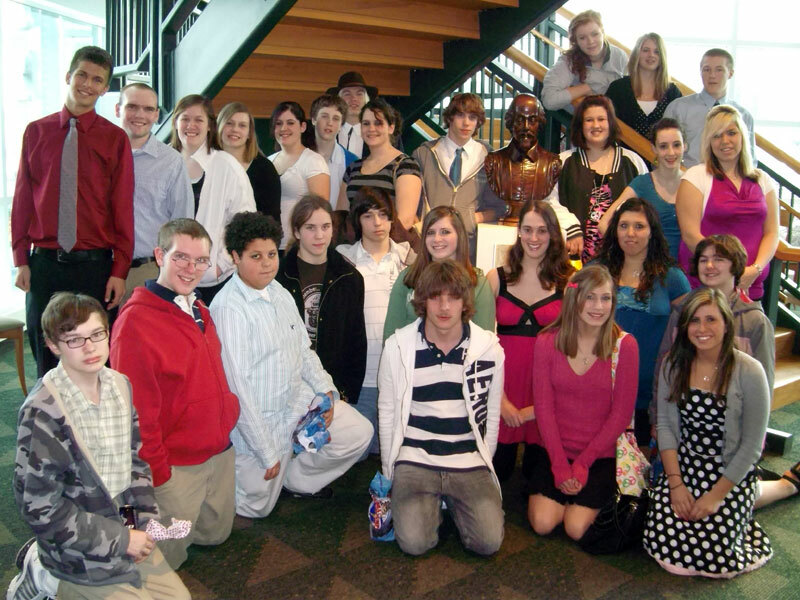 The Beaver Island Cultural Arts Association purchased tickets for the group to attend the Chicago Shakespeare Theater's production of Twelfth Night . Students also visited the John Hancock Center, the Museum of Science and Industry, and the Shedd Aquarium. When the Beaver Island Cultural Arts Association, the non-profit sponsor of “Baroque on Beaver,” was invited to help support the recent trip of Beaver Island High School students to Chicago , they agreed. Then, when they learned what a wonderful experience it actually was for the 29 students to attend “Twelfth Night” at Navy Pier's Shakespeare Theater on April 8, they could not have been happier or applauded more energetically! During the 2008-2009 school year, the BICAA has provided string instruction for eleven BICS students through the Crooked Tree Arts Center , including the arrangement for rental instruments and transportation of instructors to Beaver Island . And, for the first year, the BICAA will provide several “scholarships” for students who would like to attend MAD Camp on Beaver Island in July. 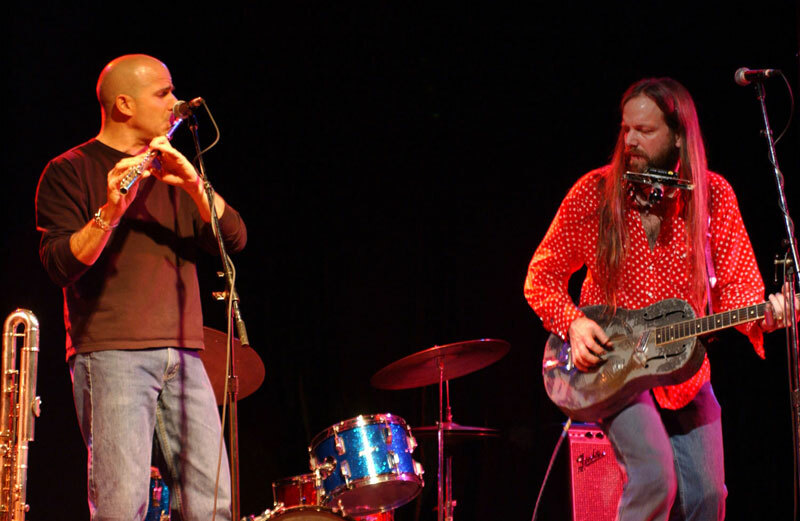 When the musicians arrive for “Baroque on Beaver - 2009” they will look forward to performances at CMU on Thurs., July 30; the Community Center on Fri., July 31; and at Holy Cross Hall on Sat. evening and Sun. afternoon, Aug. 1 and 2. And, this year they will also look forward to including interested local and visiting students in musical instruction and providing an opportunity for them to perform in an informal performance. 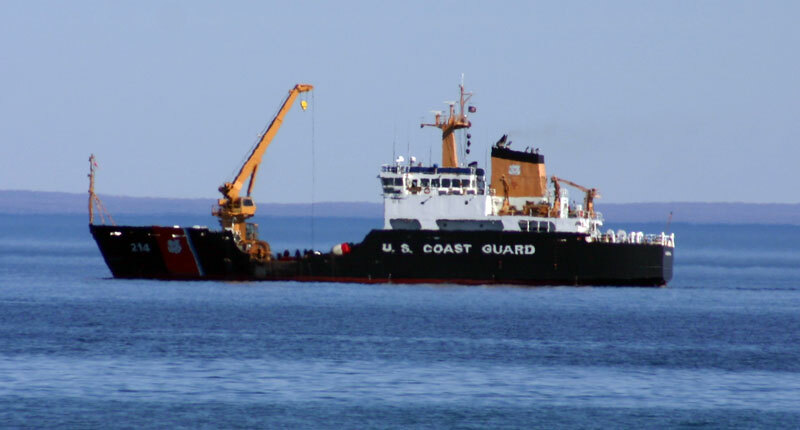 The Beaver Island Cultural Arts Association has recently learned that they have received partial support from the Michigan Council for Arts and Cultural Affairs and the Cheboygan Area Arts Council. 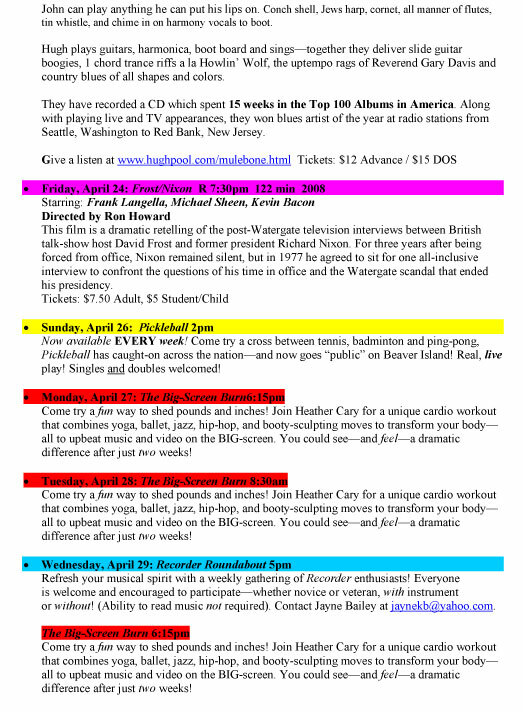 Additional information about these programs and schedules is available on the www.baroqueonbeaver.com website. 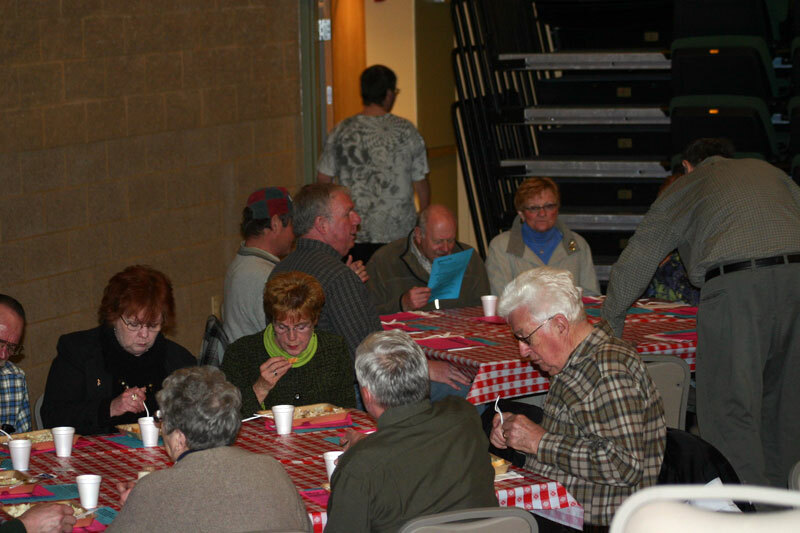 The Beaver Island Food Pantry had another successful food distribution, Saturday, April 11, 2009. Many, many thanks for the generous donations of food and also for donations of cash that allow us to include vouchers for perishable items. The next food distribution will be Saturday, May 2, 2009. Drop-off sites for food donations (in alphabetical order--for the concrete-sequential committee members!) are the Beaver Island Christian Church, the Beaver Island Community Center, Fresh Air Aviation, Island Airways, and the Beaver Island Rural Health Center. 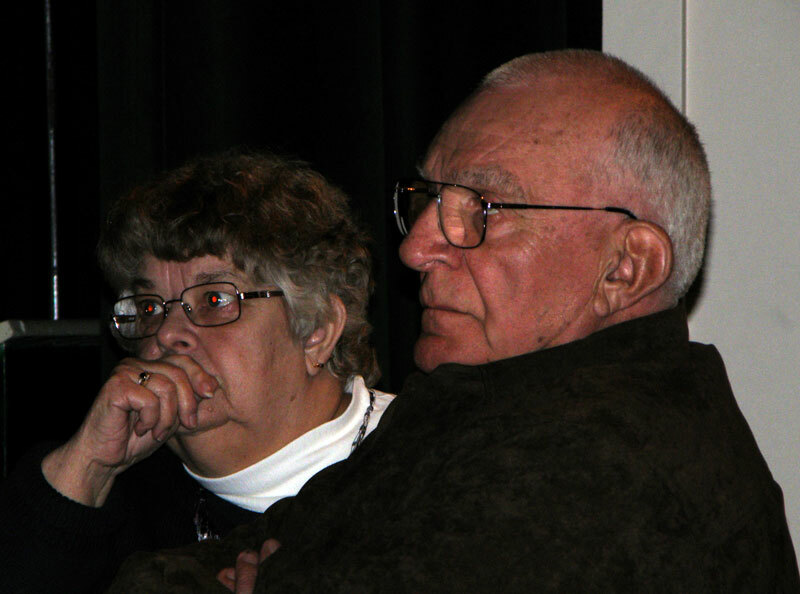 On April 6th at a secret location the Beaver Island Chamber of Commerce selected the Citizen of the Year for 2008. The Chamber received 31 nominations for 18 different individuals, couples or organizations. The selection will remain a secret until the award banquet. This year's banquet will be held at the Shamrock on April 25. There are three meal selections with prices starting at only $17.00 for full meal deals that include appetizers and desert. Reservations are necessary and can be made by calling the Shamrock at (231) 448-2278. The Beaver Island Chamber of Commerce Citizen of the Year award banquet will be held at the Shamrock on Saturday April 25. The change from the Beaver Island Lodge was made because of a change in Lodge's planned opening date. hors d' oeuvres and desert. Seating will be limited. Reservations are needed and can be made by calling the Shamrock at (231) 448-2278. 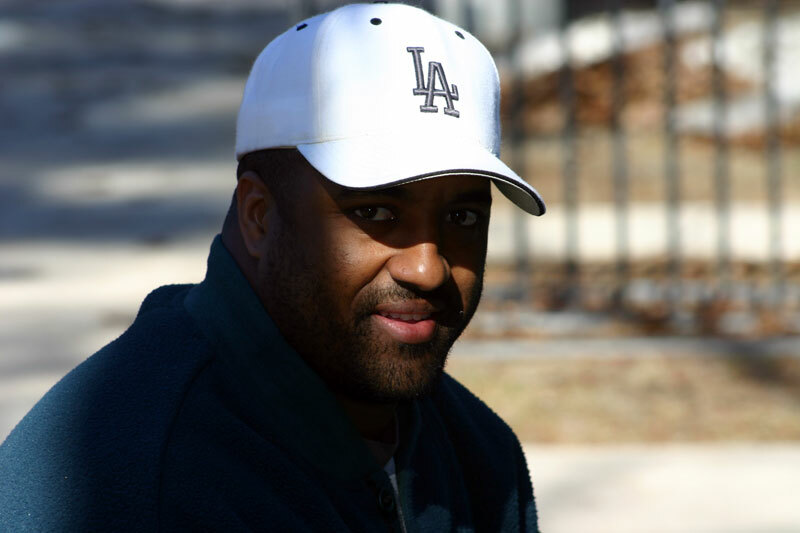 One of Michigan's most successful independent tourism business marketing representatives will speak at this years Citizen of the Year award banquet. She has been called a cheerleader for Michigan travel and tourism. Dianna Stampfler is a graduate of Western Michigan University and worked for the West Michigan Tourist Association (WMTA) for seven years before starting her own business, Promote Michigan. She hosts two radio programs, is a contributing editor for Michigan Blue magazine and is a regular guest on the syndicated Travel Queen radio show as well as many other travel related programs. He client list includes St. Julian Winery, Traverse Tall Ship Company and the Michigan Apple Committee to name just three. Stampfler is an expert on developing media coverage and as Marketing Director for WMTA developed more than $3.5 million in accumulative media coverage for members, including the Beaver Island Chamber of Commerce. She will speak at the banquet about how to use the internet to market your business on a shoe string budget. 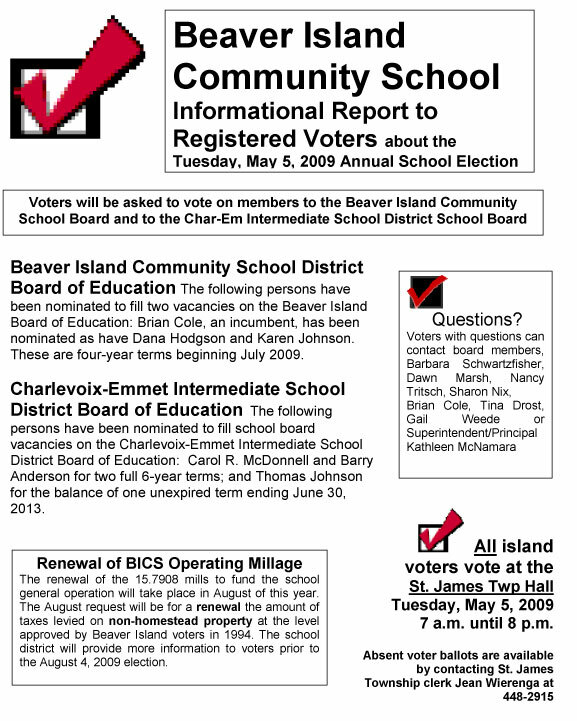 The Beaver Island Chamber of Commerce 2009 Visitor & Business Directory will nearly double in size from previous additions to 8 ½ inches tall by 5 ½, about the size of the Island Telephone Directory. The colorful cover, designed by Jeff Cashman, features a three masted tall ship on Paradise Bay and eight additional beautiful Island photos. Both Island lighthouses are pictured on the cover and a new section inside focuses on the many lights that can be visited by boat or plane from Beaver Island. Copies for the new publication will be distributed at the Citizen of the Year banquet. The Lake Michigan Circle Tour & Lighthouse Map published by WMTA features “The many lights of Beaver Island,” in the editorial copy and includes a Chamber / Boat Co. / Fresh Air Aviation ad. A free copy of the large map will be available at the banquet. You can order one at www.wmta.org or by calling (800) 442-2084. Phil and Lil are both home. Please call them before visiting. 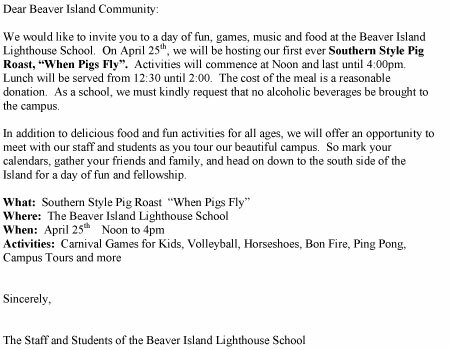 Beaver Island Community Center ! 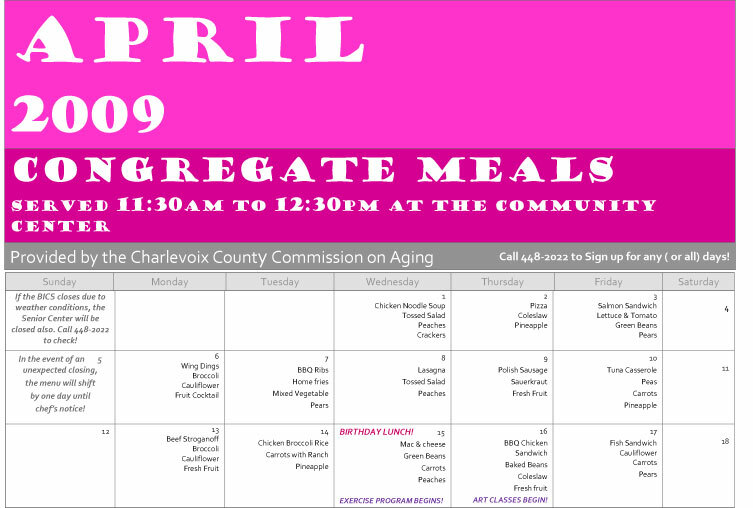 Senior Congregate Meal Program – the Best “Fast Food” on the Island ! 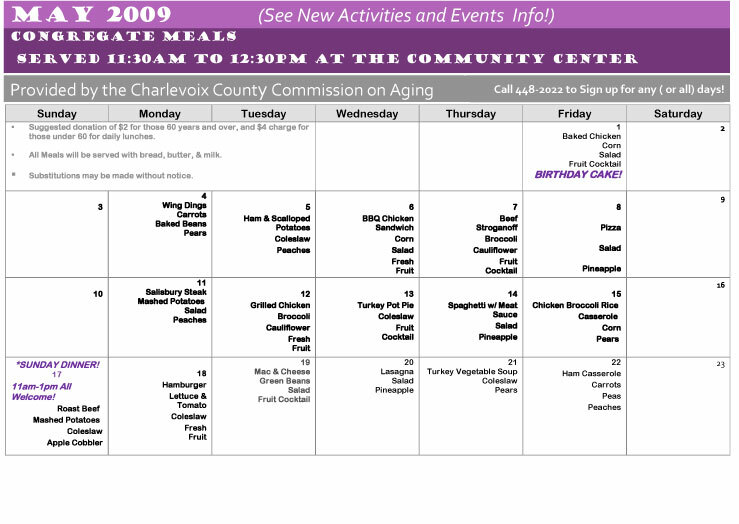 Monthly menus and weekly sign-up sheets are available at the Community Center and will soon be available on-line. Participants are encouraged to sign up in advance on a weekly basis, for ordering purposes. Don't worry if you can't make it that day—we'd rather have too much than too little! If you didn't sign up in advance but want to join in if possible, just call Ann—or leave a message—at 448-2022 by 10:30am. Suggested donation for Seniors 60 and older is $2, and those under 60 $4. 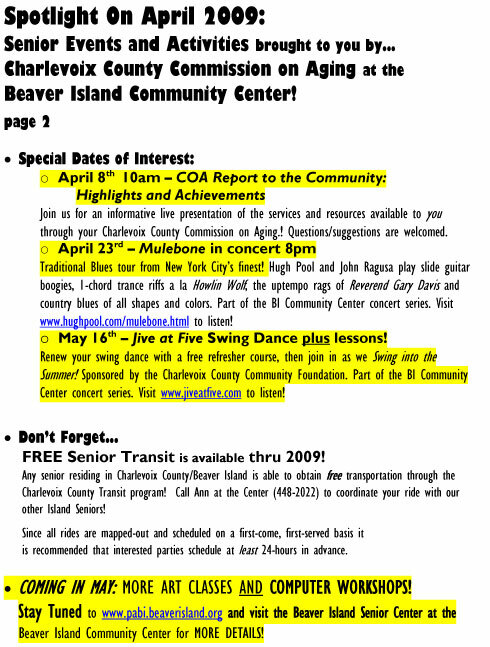 Any senior residing in Charlevoix County/Beaver Island is able to obtain free transportation through the Charlevoix County Transit program! 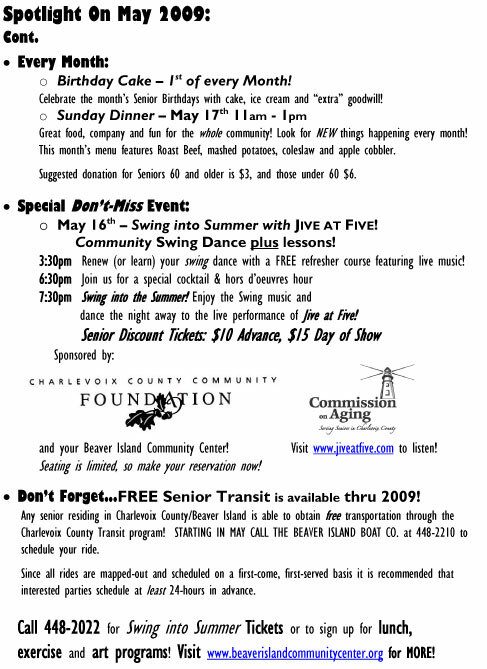 Call Ann at the Center (448-2022) to coordinate your ride with our other Island Seniors! Since all rides are mapped-out and scheduled on a first-come, first-served basis it is recommended that interested parties schedule at least 24-hours in advance. 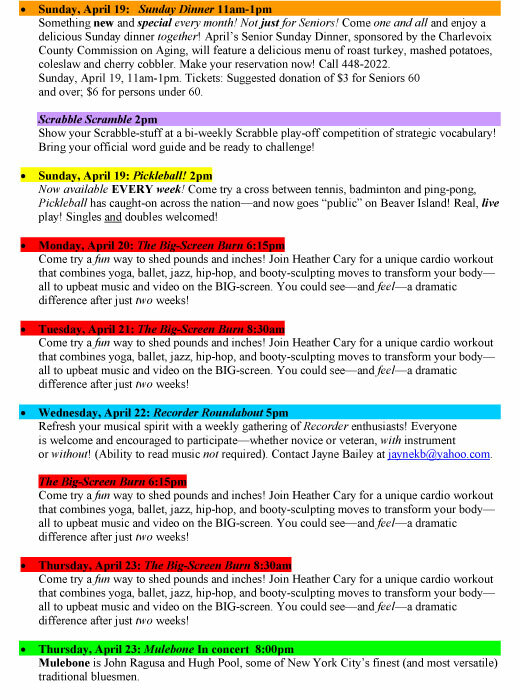  COMING IN APRIL: ARTHRITIS FOUNDATION EXERCISE PROGRAM! 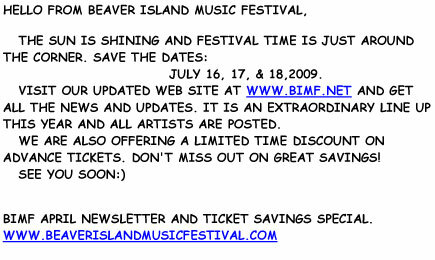 Brand new on Beaver Island! 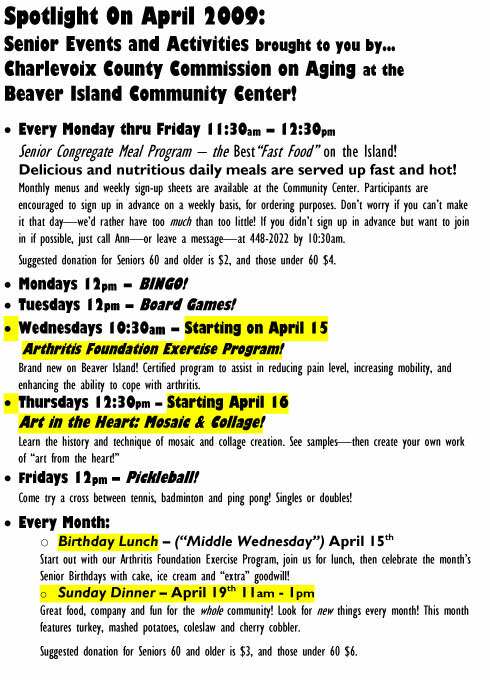 Utilizing an evidence-based, certified recreational exercise program to assist in reducing pain level, increase mobility, and enhance the ability to cope with arthritis, the Beaver Island Senior Center seeks to provide trained, guided physical activity programs that are both safe and beneficial for all participants. Sessions last for 45 minutes to 1 hour max and include fun group activities! Provided by AFEP-trained instructors Ann Partridge and Pam Nicholas. Art in the Heart: Mosaic & Collage! (Most materials provided, other than "personal" items. Class structure is based on three weeks @1.5 hours to complete project). Activity leaders: Dawn George and Ann Partridge; Assistants: Pam Nicholas and Brittany Hahn. 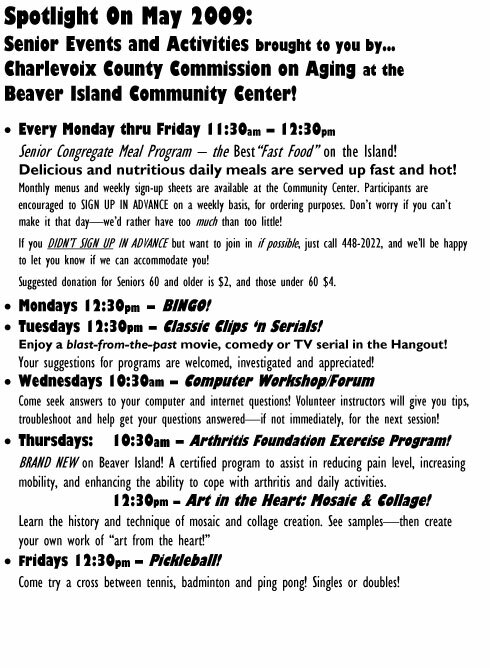 Stay Tuned to www.pabi.beaverisland.org and visit the Beaver Island Senior Center at the Beaver Island Community Center for MORE DETAILS! No one tried on this one so it will stay for another week. 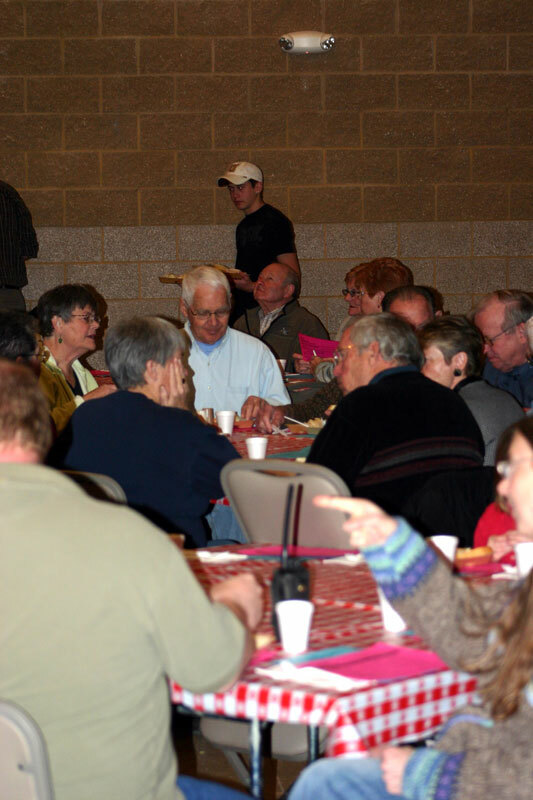 How many years has the Easter Brunch at the Beaver Island Christian Church been occurring? When was the first one? Clue: If you get your mail and go to the store, you must pass this. Okay, so no one guessed it. This is on the dock at Welters. Remember the changes happen so quickly. 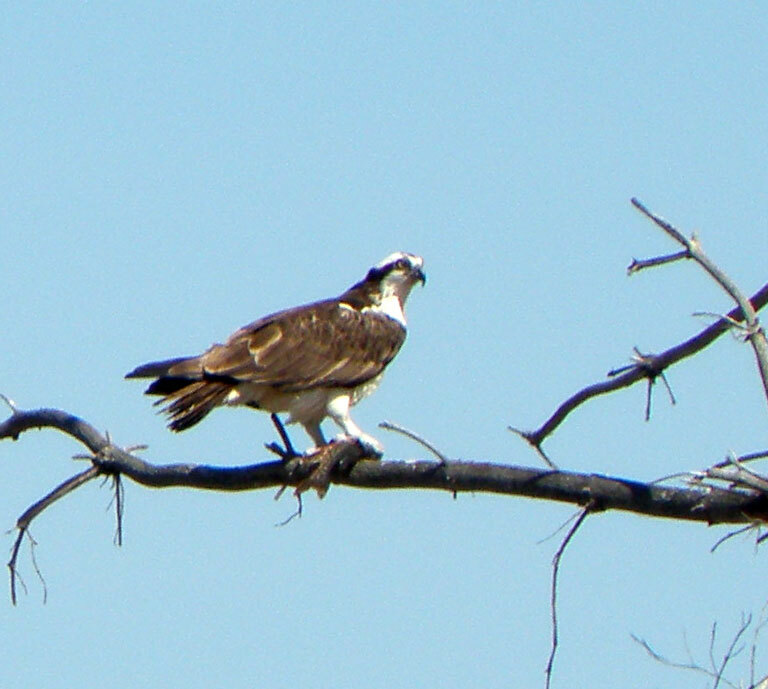 This picture was taken on April 6, 2009. Two weeks later and there's no snow or ice.